Faculty of Organizational Sciences, University of Belgrade, leading academic institution specialized in scientific, research and educational activities in management and information systems, publishes quarterly (in English) International Journal “Management”. 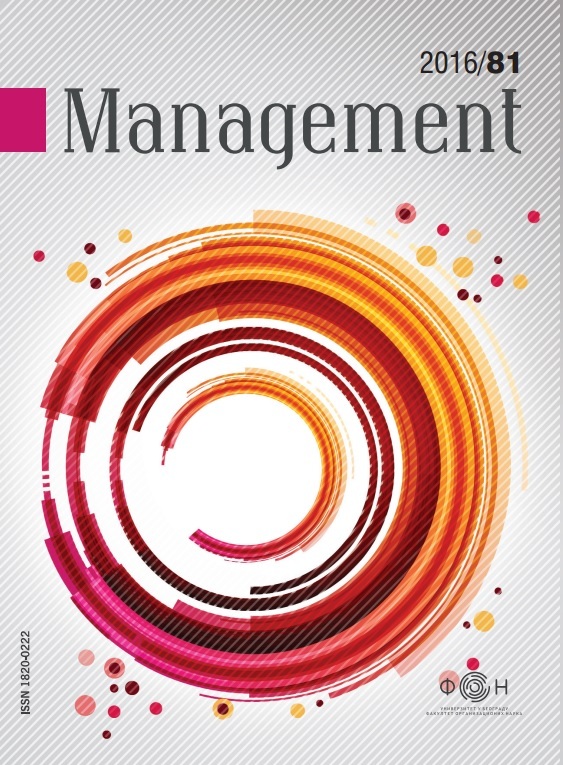 The journal “Management” fulfills the aim to enable relevant information exchange and communication between scientists, researchers, managers, people in different business areas, coming from universities, institutes, companies and public services. It represents an open discussion arena for new views, experiences and ideas concerning problems and management development tendencies in national and international perspective, with the aim of giving support to economic and social development. The editorial board encourages new contributions in the wide field of management theory and practice, and is permanently opened for new ideas and suggestions. The journal promotes cooperation with eminent authors from the country and from abroad, as well as with highly esteemed institutions that have shown distinguished results in the management domain. The journal editorial board is constituted on reciprocal bases with participation of domestic and foreign experts. It should be emphasized that the journal has been initiated with the ultimate goal to increase knowledge bases, experience and results for which we have strongly expectations to be realized with your engagement and full participation. The contributions are refereed by external assessment of two referees which are experts in the field and chosen by the Editorial board.